Probably, you feel find it quite odd, but I have to confess, I`ve never seen “The Muppets Show” in the whole my life. How could this have happened to me, you may want to ask me? But the fact remains. 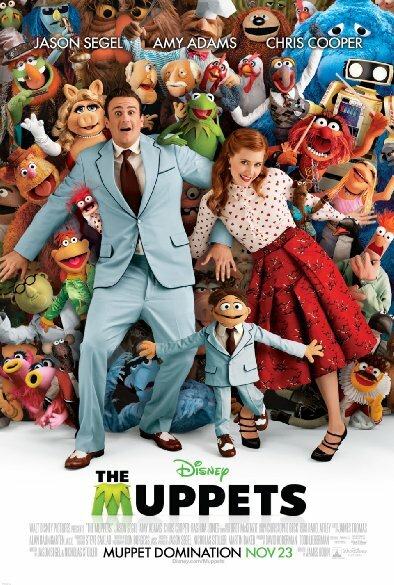 Due to upcoming movie “Muppets Most Wanted” with the master of transformation Tina Fey, I`ve decided to watch the old one with Amy Adams, Jason Segel, Chris Cooper and Rashida Jones. The film starts with Walter (Voice of Peter Linz) dreaming of The Muppets show and how one day he wish to meet all his beloved characters in person. Gary (Jason Segel) is being supportive brother, wants his younger Walter`s the biggest dream in his life come true. Since Gary is about to celebrate his 10 years relationship with Mary (Amy Adams), he chose to go to L.A., and in that case, he could celebrate his special day with MAry in L.A.while Walter will face his dream. And by the time when they arrived to L.A., they have realized that The Muppets have almost lost their old theater because of greedy oil tycoon. Reuniting is the only way is to save their theater. James Bobin is not one of my favorite movie directors. It is quite hard for me to mention any of his movies I would really like. And “The Muppets’ is the only one I really enjoyed watching. Maybe because the story itself was quite interesting to follow or maybe “The Muppets” were too good to not love them. What is really amazed me is I found myself smiling and crying throughout the movie. Yes, it is a sad story of the Muppets who confronting against Greedy villains in order to earn enough money to get back The Muppets Theater. Fortunately, even though the Muppets fan were grown up, there were still many people who still remember them, and willing to watch their show one more time. I don’t want to give away the whole story of the movie. But there was one scene; I am willing to watch over and over again, when Gary and Walter were performing a song “Man or Muppet.” That scene was absolutely beautifully done. And performance itself was so great, that I could not stop myself from listening to this song over and over again.